Tenshin Reb Anderson was born in Mississippi, grew up in Minnesota, and left advanced study in mathematics and Western psychology to come to Zen Center in 1967. He practiced with Suzuki Roshi, who ordained him as a priest in 1970 and gave him the name Tenshin Zenki (“Naturally Real, The Whole Works”). 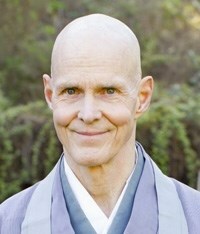 He received dharma transmission in 1983 and served as abbot of San Francisco Zen Center’s three training centers (City Center, Green Gulch Farm, and Tassajara Zen Mountain Center) from 1986 to 1995. Tenshin Reb Anderson continues to teach at Zen Center, living with his family at Green Gulch Farm. He is author of Warm Smiles from Cold Mountains: Dharma Talks on Zen Meditation and Being Upright: Zen Meditation and the Bodhisattva Precepts. Published in 2012: The Third Turning of the Wheel: Wisdom of the Samdhinirmocana Sutra, a guidebook to the workings of consciousness and compassionate awakening. More information and registration details to be announced.